A few weeks ago, I got lost in my phone and dug myself into a deep Instagram wormhole. I found this random Instagram account and I literally spit out my coke as I watched these guys smoke butane plants with real dolls. This random account belonged to full-time Instagram provocateur, @TaylorKyles. Taylor Kyles produces long-form content through Instagram’s relatively short form platform and his profile is definitely worth checking out. Mark your calendars for Friday, July 27th because Taylor says this is when he will post the most viral video he has ever made. 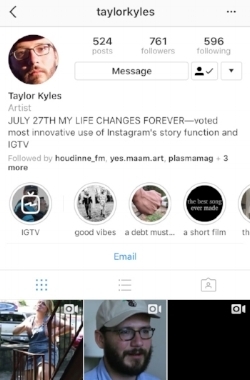 Taylor has been making these IG stories and films for about 6 months now and his style has changed over time. He says he used to post, “spontaneously without editing or trimming down the fat,” but this blurred the lines between himself and the internet funhouse character he created. Now he uses plots, overarching themes, and edits his shots carefully. This has allowed him to distance himself from his Instagram presence and progress past mere documentation of his day to day life into the realm of narrative storytelling where films exists. His filmmaking on IG begins with the desire to tell a story. He’s told a lot of stories over time, but the most important one, to date, is about his friendship with Murk Daddy Flex, from Athens, Georgia. ‘The Best Song Ever Made,’ is the origin story about Taylor’s friendship with Murk Daddy Flex and their journey to create the best song ever made. He said there was no pressure to tell the perfect story, it came naturally because he was sharing a story about a friend that he deeply cares about. Taylor seems like a really interesting guy. So, I asked him about his other endeavours, to which he replied, “I don't have very many hobbies. I mean I do things, but not very well. I would love to say that I double-down on life, and have an intricate fort that I've built in my backyard or that I've rebuilt a 1952 Honda motorcycle from parts on eBay. I'm not that guy though. I'm just your neighborhood jester who is trying to navigate his way throughout the entertainment industry. My job is to make you laugh. My job is to make you experience cataclysmic abysses that you had never felt possible.” Basically, Taylor is just a guy on the internet trying to make people laugh and I love that. Follow @taylorkyles on Instagram because he’s a genuine dude who just wants to make you laugh. Also, he’s posting something super exciting on Friday, July 27th.